Eclipse viewers congregated near the vegetable garden for a view of the big event. Photo by David Baker. When I heard about the eclipse, I immediately thought of watching it in Brasstown: I have friends to stay with, I know where there’s a big, open field, and it’s always nice to be in a special place for a celestial event. So Saturday afternoon, I headed down the road with two friends, Dane and Jessica. Folks congregated near the garden gate. Throughout the day Sunday, more and more people—friends and strangers—arrived at the house until it felt like a large family gathering. On Monday at noon, we walked over to the Folk School and laid out a picnic blanket on the edge of the gardens. If you didn’t get to see the eclipse, here’s what happened. Crescent shadows on the Rainbow Bridge near the Rivercane Walk. At 1:05 it began. 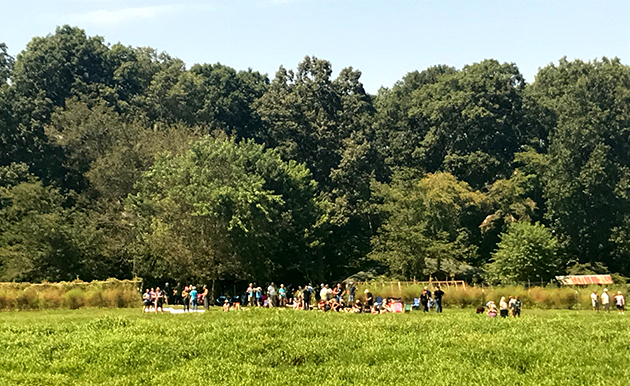 Everyone put on their eclipse glasses and watched the first tiny edge of the moon appear at the top-right of the sun. Everyone snapped photos of everyone else watching. Someone had a special telescope. Dane taped eclipse glasses to a pair of binoculars. After a minute, I’d retreat to the shade, only to find myself back out there, checking the sun, a moment later. 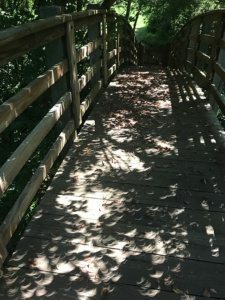 As more of the sun disappeared, people spread white sheets to observe the crescent shaped spots of sun filtering through the trees, or held up pinholes to cast a crescent onto the ground. At first, the daylight didn’t seem different. I was surprised by how little of the sun it took to make the day bright; even when the sun had been reduced to a crescent, the light seemed almost normal. It did get a little cooler, though, so at 2 p.m. I ventured out into the field. More and more viewers were gathering at the edge of the garden, and I liked the relative silence in the field. 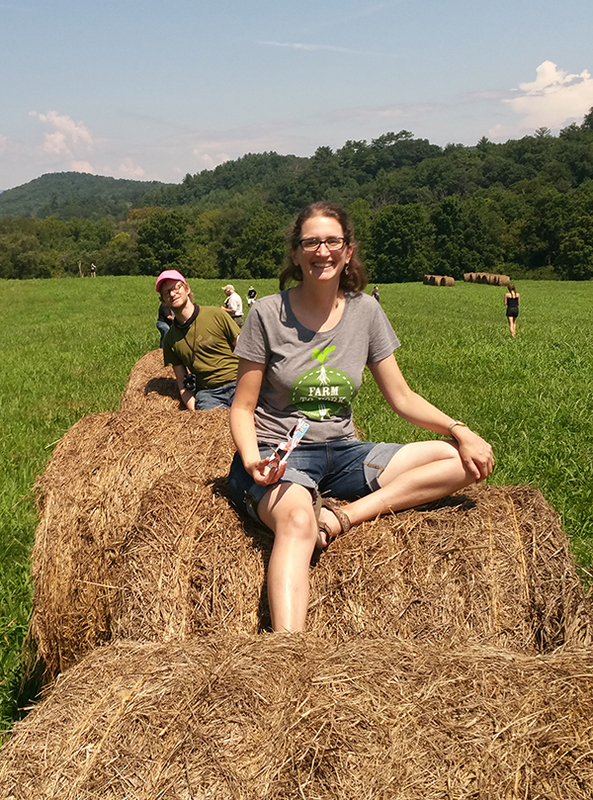 When Dane and Jessica joined me, we walked out to the ever-present Folk School hay bales and climbed on. Eclipse watchers by the Cooking Studio watch as the moon just begins to touch the edge of the sun. Photo by Pam East. 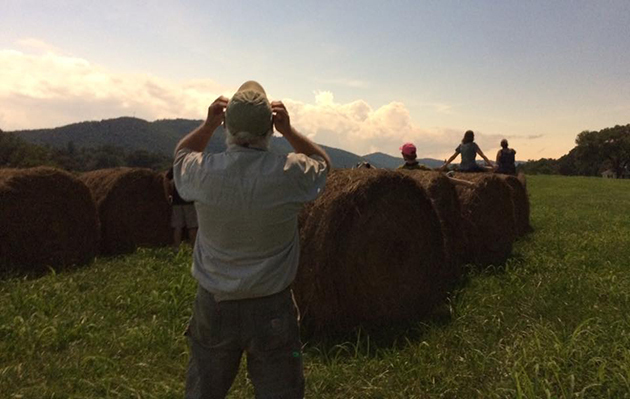 John Clarke, Folk School Building & Grounds Manager stands in the field to watch the eclipse by the hay bales. Photo by Karen Hurtubise. Around 2:20, the light began to noticeably dim. The barn swallows flew out from their nests at Davidson Hall, swooping to catch insects, but after a minute, they retreated, perhaps realizing that something was not quite right. All around the horizon, the sky grew pink, like a 360 degree sunset. Only a fingernail of sun remained. I took off my glasses because I wanted to watch the darkness set in. Venus appeared overhead, along with two or three other bright stars or planets. Then, in the direction of Field House, there was a deeper darkness, like a menacing storm covering the trees; you could imagine you saw the shadow coming. Then the sun went out. I looked overhead (no eclipse glasses, time: 2:34:29) and saw the final brightness of the sun still shining out from the left side of the moon. It dimmed and went out, and for a moment everything looked dark, and then the white corona of the sun appeared, with the black disk of the moon at its center. 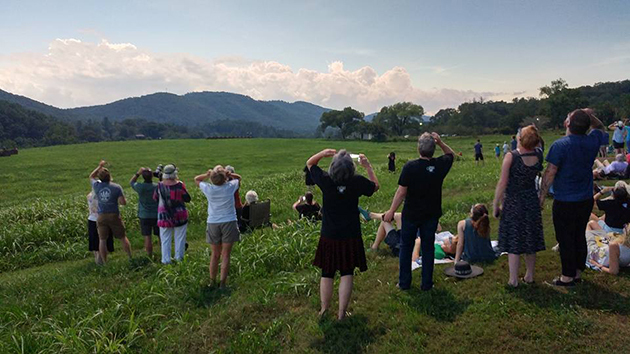 Near Totality at the Folk School. Photo by Liz Domingue. The corona wasn’t symmetric; there was a complete ring, but it smeared out on the right side, and farther out on the left. It looked unlike anything I’d ever seen. And it was up in the sky—there was no way it was being projected or imitated. It wasn’t like looking at a photo of an eclipse, because there was so much space around it, a whole sky’s worth. Sara Boggs looks at the eclipse in totality. A collective gasp/shout went up from the crowd. I might have whooped. Next to me, Jessica repeated, “That’s so amazing. That’s so amazing,” over and over. But everyone knew we only had 2 minutes and 26 seconds, so no one moved. I looked around at the deep twilight colors—it hadn’t gone pitch black, and only the few bright stars were visible—and then I looked back at the eclipse. It seemed far too soon when the sky to the right of the moon began to brighten. “Here it comes!” someone warned. A few seconds later, the sunlight burst through. I ducked my head and donned my eclipse glasses, then checked the reappearing sun. But then I found myself taking the glasses off, to see the eclipse again. “I can’t,” I told myself. “It’s gone.” Around me, the darkness was fading fast, the hot sunlight returning. Already it felt over. It felt like the day after my birthday, if I were going to live forty more years and never have another birthday. 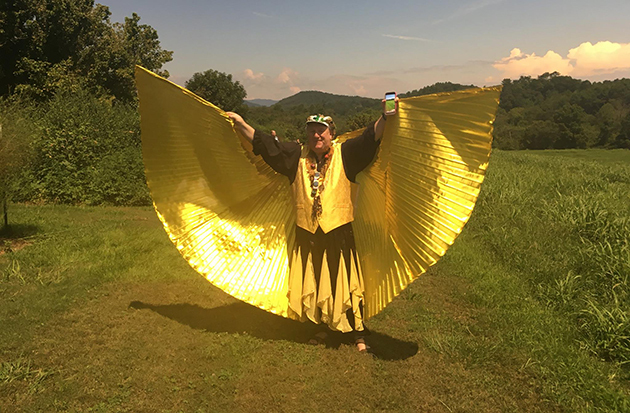 David Baker in his festive eclipse garb. 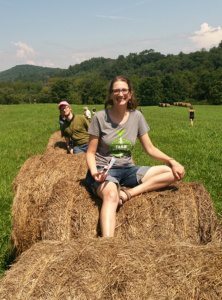 Dane & Emily on the hay bales, post-totality. There was something real about the eclipse, and later I thought in the same way there is something real about the Folk School. 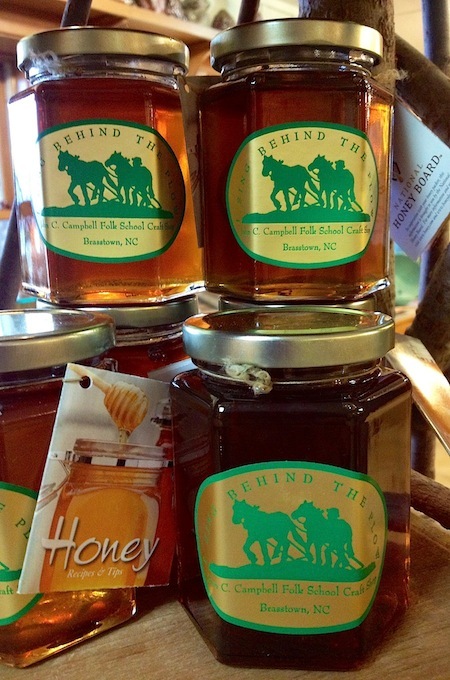 I couldn’t rewind 15 seconds to watch it a little bit more, the same way you cannot hit “undo” when your pottery collapses on the wheel or you break the antler off your deer carving. You must go carefully. Of course, someone could probably simulate a pretty good solar eclipse in a theater, with lights dimming and a small breeze blowing. 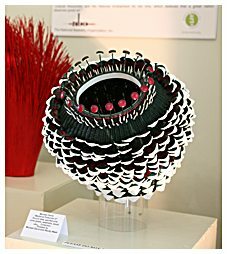 In the same way, you can buy a machine-woven blanket or a five-dollar basket made by a poorly paid woman churning baskets out in a third-world country. But it’s not the same as a craft handmade with love and care. There’s something deeper that cannot be imitated. 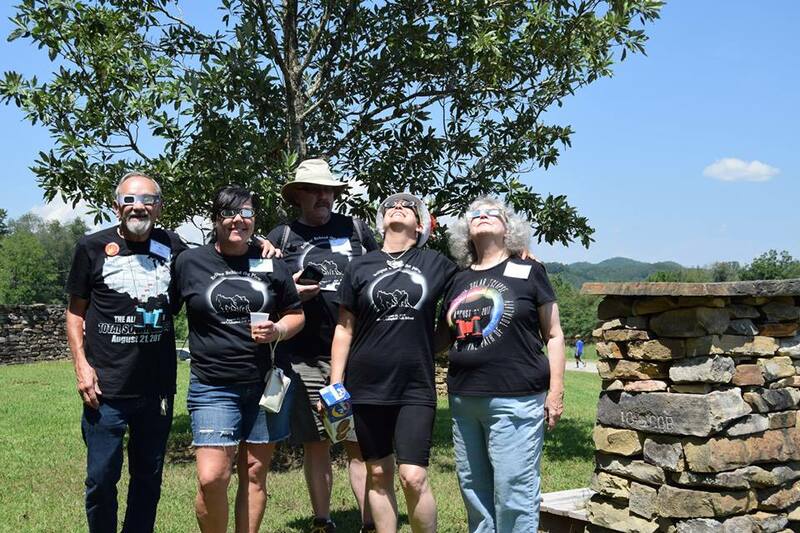 We were there at the eclipse with family, sharing the experience. And the eclipse was viewed in the wide-open sky. You might recreate the look of it, but not the soul. 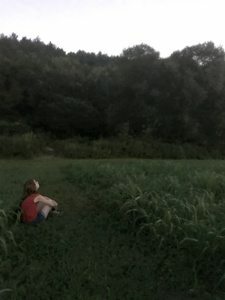 As we came down from the hay bales and shared our thoughts, someone mentioned a friend who’d declined to watch, saying eclipses were nothing special. I could see being disappointed if you stepped away from the office at 2:30, expecting to be awed by the highlight reel of the event. Like a craft, the eclipse was a process, and we’d been there at the start, in tune and watching. 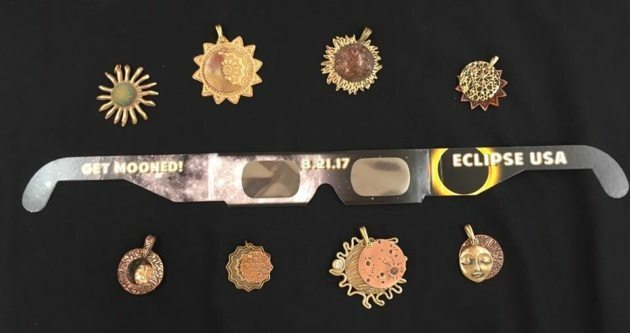 Students in Pam East’s jewelry class made beautiful eclipse-themed pendants for the occasion. Photo by Pam East. 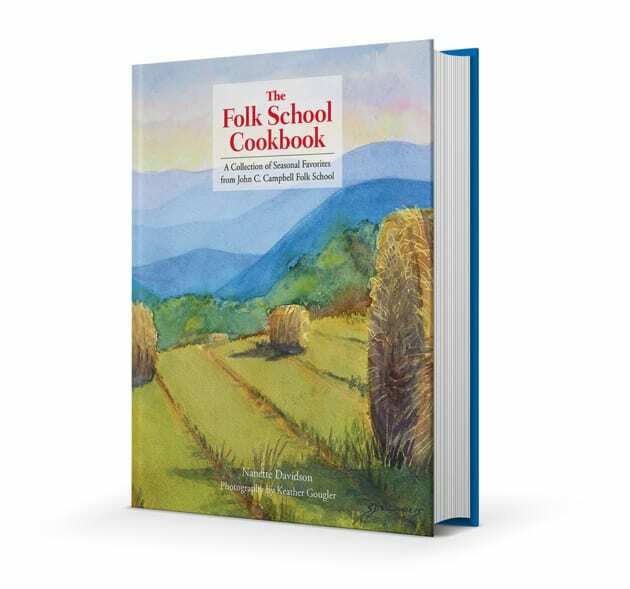 Emily Buehler is the author of this blog and a frequent bread instructor at the Folk School. She became a bread baker in 2001, intending to take a break after finishing a degree in chemistry. Six months later she began teaching bread classes. 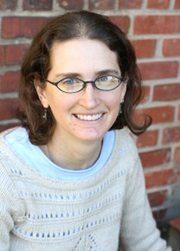 Emily has written two books: one on bread making called Bread Science, and one about her bicycle trip across America called Somewhere and Nowhere. Visit Emily’s website for more information. Emily will be teaching bread making class again in October 2017. Come see what our students are up to this week! Thank you so much for putting it into words, Emily! So many of us watched the eclipse with the wonder that you describe. We also whooped and hollered, a few seconds after you did, in Hickory Tavern, SC. It is a day I will long remember. And it is so true that “you had to be there.” No newsreel or re-enactment can touch the grandeur, wonder and excitement of the moment the sun disappears!